A dog stole the show at a baseball game after attempting to steal a bat from a player during a game. 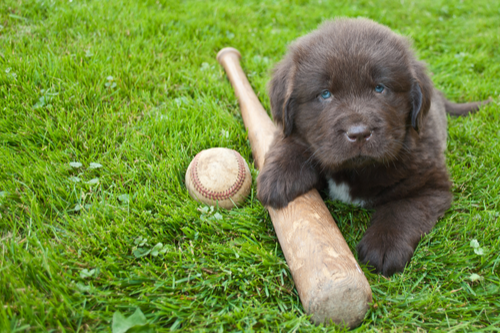 The pup named Miss Lou Lou Gehrig works as a bat-collecting dog for the Greensboro Grasshoppers, a Minor League Baseball team in North Carolina. Her job involves retrieving the bat when a batter drops the bat after making a hit but Lou Lou got carried away and tried to take it before he had hit the ball. When Grasshopper player Johnny Santos put the bat on the ground while waiting for the pitcher—a highly unusual move—Lou Lou ran across the field and made a grab for it. As spectators chuckled she made a second grab for the bat, causing more ripples of laughter in the stadium, before play resumed. She was only doing her job.